After an uninspiring long drive from Guilin, we just barely made it to the ship, literally minutes before it left. The ship is fairly rough, but we got good seats on the top deck, and they were right next to a small forward open deck where the views were good. This small deck was far less crowded than the “sun deck” up above. Of course, still very, very smoggy, or “misty” depending on your perspective, and we could only see the close-in mountains, but still very pretty. Limestone karsts are beautiful one-of-a-kind formations. Each bend around the river was prettier than the last. My pics of the scenery don’t do it justice – all are pretty disappointing because of the “mist”. 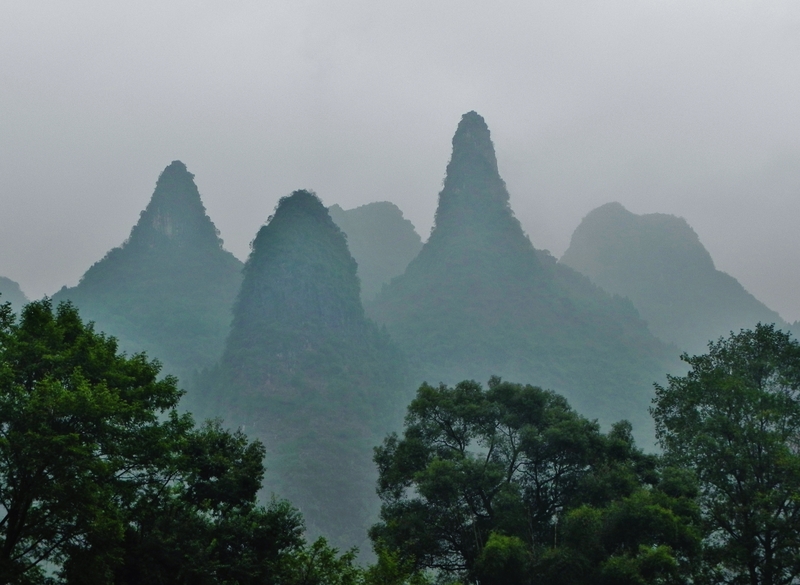 We could see why Chinese landscape painters came here for their inspiration. Pretty lush vegetation along the bank of the Li River with graceful bamboo. Up the sides of the rock mountains are verdant trees and shrubs. Bamboo rafts the locals use are now mostly made of PVC pipes – lasts longer but not as picturesque. I did get some pics of a real bamboo raft laden with fruit coming alongside our boat selling his produce. Saw a couple of water buffalo, but wasn’t quick enough to get good pics. Kinda blurry. And we saw lots of waterfalls. For a while we were closely following another cruise boat and we watched a man on the bottom deck of the other boat washing the dishes with a hose that brought water in from the river. On the second deck several men were cooking food in woks. “Not very sanitary conditions” is an understatement! I did not touch the food on our cruise – opted for the bread and cheese we had brought with us from the hotel’s breakfast buffet. (I had difficulty smuggling this food out – the hostess ran after me yelling that I couldn’t take any food with me. Had we been smarter, DH would have brought the backpack like Phil and Sandra who had no trouble with their smuggling.) DH was brave and actually ate some of the boat food – hope he doesn’t regret it. The bathrooms on boat were awfully disgusting. No water to wash your hands, but instead a communal plastic bucket along the outside deck – have no idea where the water came from. I opted for a healthy dose of Purell instead. After lunch they were selling shots of snake wine on the boat. Can you see the little fella’? We passed – even DH wasn’t adventurous enough. A few miles from Yangshou, I caught a glimpse of this little pagoda on the bank of the river. I was quite taken with it, and glad I got these couple of pictures before it glided out of view. Our guide told me later that it was an old now-abandoned Buddhist temple. 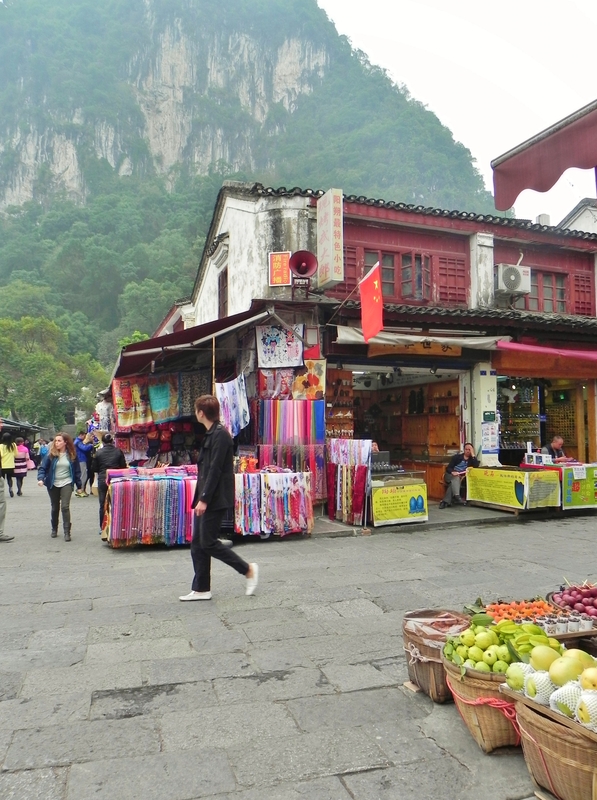 We landed in the little town of Yangshou and strolled through vendor laden West Street. I bought 2 osmanthos perfumes. Haggling started at 38 yuan for one – ended up at 2 for 40 yuan. Osmanthos trees are an evergreen that blooms in late September and early October, and the scent is sweet, yet light. Lots of fresh produce. The magenta fruit with orange insides is Passion Fruit. Quite good, just look out for the flies! And the folks here like their food HOT, so plenty of chili peppers. 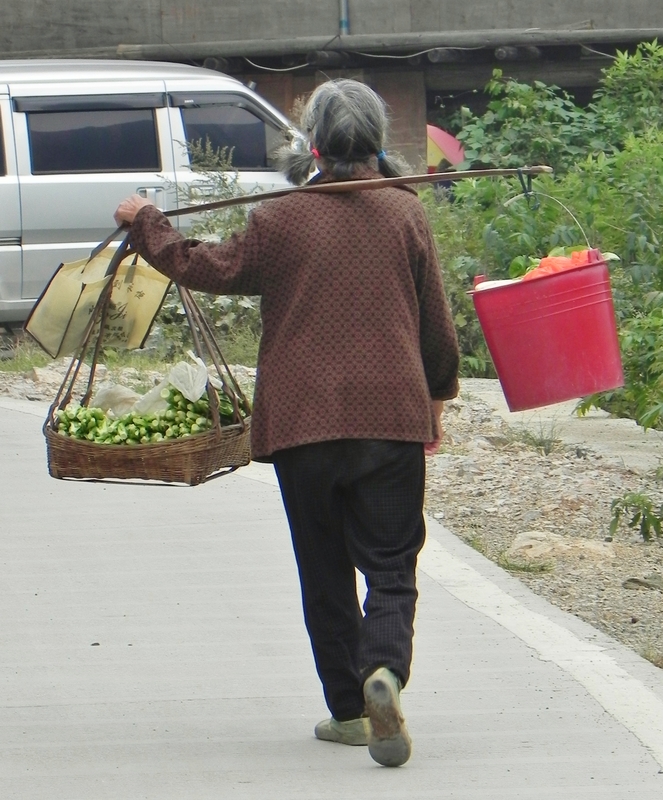 I saw a little old lady with a bamboo pole over her shoulder carrying baskets of vegetables on each end walking down the road. 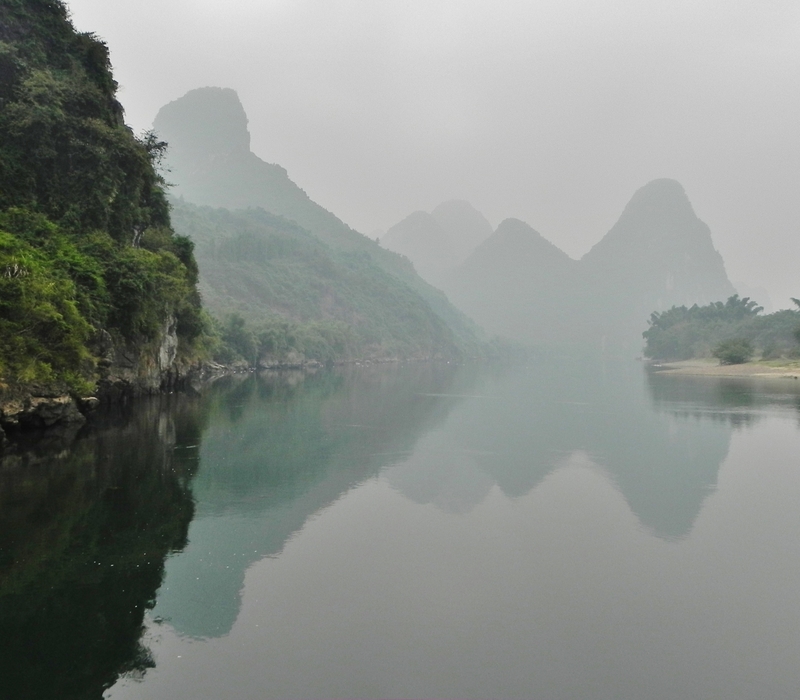 Our destination was a little village along the Yulong River ( Jade Dragon River). We got out of the “golf carts” and crossed the little Jade Dragon Bridge (no guard rails on the sides) and saw lots of bamboo (and some PVC) rafts taking Chinese tourists for rides along the Yulong. As each raft would pass under the bridge, the raft boatman would have to pay a toll to a man standing on the bridge who was lowering a basket on the end of a stick to collect the toll. On the other side of the bridge our guide knew of a rice field that had not yet been harvested. It was now a golden color, about ready to be harvested. Not that many rice kernels on each stalk. 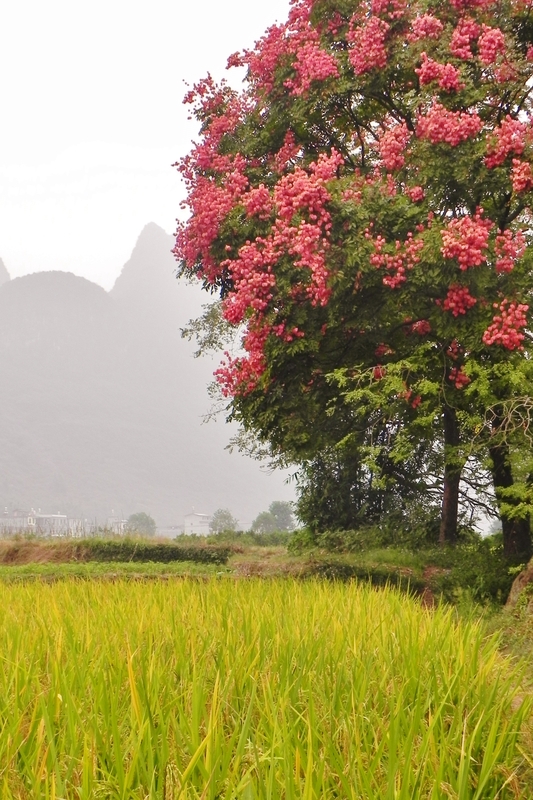 Beside the rice field and along the riverbank, a beautiful tree had reddish flowering blooms on the end of each branch. According to our guide, it is a “guo qing shu” (loosely translated as “Chinese national day tree” because it only blooms in the beginning of October around the time of the big national holiday). [ This tree could also be what we saw in Xi’an, only there it was a paler version. ] Took several pictures of it with the rice fields in the foreground – I feel a quilt in the making! On the bridge as we were coming back we saw a farmer herding (literally herding) a small flock of white ducks across the bridge, followed by a line of black ducks, single file. Hilarious! The guide told us he was taking them to a rice field to eat bugs and worms. Not sure if this was mainly to feed the ducks or to clear the fields of pests. After the golf cart ride dropped us back in Yangshou, the van picked us up and we hit another traffic jam. 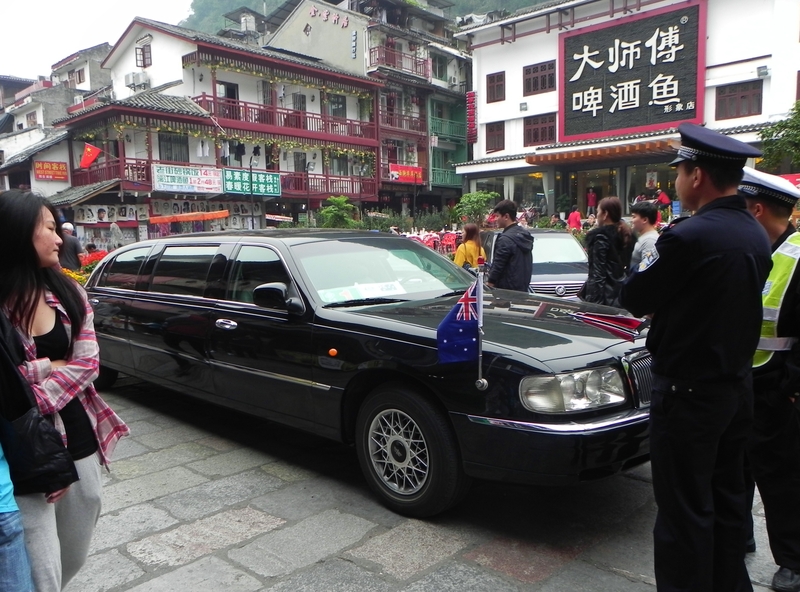 This time because of road closures due to the Australian PMs cruise on the Li River. The lady is beginning to bug us – doesn’t she know we’re trying to get places? And I’m having a bit of difficulty believing she was on one of the same shabby Li River cruise boats we were on, I don’t care what they tell us! We drove for about an hour to the Tea Research Institute. This was a welcome surprise, and not on our itinerary. I’d never seen live tea plants in a field before, and it was a joy to see growing what I’ve been enjoying all these many years. And you can’t beat the scenery in the background either. I wonder if DH and I should start trying to grow some back home…? They gave us a short lesson on the tea ceremony. I learned I’ve been brewing tea all wrong all these years. Important not to let it steep too long. Bought some Oolong for a friend and some Jasmine that is in little balls that’s supposed to “bloom” when boiling water is added. Tea saleslady said to use all 10 balls at once, but given that the tin was 200 yuan ($30 US) I don’t think I’ll be doing that! Another sumptuous dinner buffet at the Shangri-La hotel. Man, are we putting on weight! Early to bed – it’s been a long, long day!